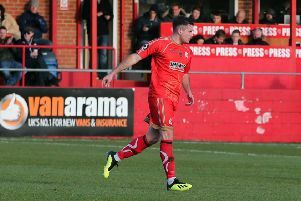 Alfreton Town manager Billy Heath was again left bemoaning the decisions of match officials as the Reds reflected on a defeat. Despite an early goal from Jordan Sinnott, they went down 3-1 at Leamington but were left rueing two ‘goals’ ruled out and penalty appeals rejected. Richard Peniket’s 13th minute header from a Dec Bacon cross appeared to go over the line before being cleared with the Reds in front. 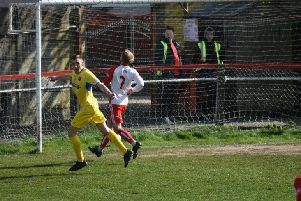 Then as they trailed 2-1, James Clifton’s swerving shot appeared to be dropped over the line by keeper Tony Breeden, but no goal was awarded despite protests from the Reds. Heath said: “We scored at least one more goal today — maybe even two. But once again our esteemed ‘friends’, the (match) officials, have done a fantastic job again! Heath said the controversial decisions did not, however, disguise a performance that he described as frustrating. “We started the game really well, got the early goal and looked quite buoyant. “But after about the 25-minute period we went into a bit of a lull, conceded a goal and, once they got that, we seemed to go into our shells again, which was disappointing. “The second goal was always going to be massive to give us a lift and we didn’t get that, so we’re disappointed with the second half performance. Heath said Alfreton’s season was now all about pride.